Several reviewers found the Lunarlon midsole responsive and lightweight cushioning. A good number of users appreciate their experience running on these shoes stable and with impact and shock absorbing. The unique blend of premium leather, suede, and synthetic rubber makes a good mix of upper materials, according to some customers. Many reviewers think the design is sophisticated, trendy and versatile for various outfits and recommended for street-style casual wear. Numerous users find the inner sleeve lining really comfortable rounding up that great in-shoe feel. A lot of customers liked the laser-siped outsole pods for its flexibility and improved traction. The lightweight shoes, as claimed by a good number of wearers, are great for everyday walking. The Lunar sole adaptation for this shoe is very soft and cushioning for added comfort, a few wearers pointed out. Some reviewers noted that they felt uncomfortable and got blisters on the Achilles heel after using this sneaker. Many users find this narrow and running small so ordering a pair half-size larger is recommended. A small number of customers noted that laces are quite short that there’s not much room to loosen the shoes. The Nike LunarCharge Premium does not scrimp on design technology and innovation. It has perfectly crafted the shoe combining design elements from successful Nike classics including the Air Max 90, Air Presto, Air Flow, Air Current and the modern touches of a LunarEpic Flyknit midsole promising superior comfort and an epic ride. With its modern city style, this modern sneaker gives lasting comfort and cushioning to last all day. Be prepared to order a size higher to get a perfect fit. The futuristic silhouette of the NikeLunarCharge Premium is an homage to five silhouettes of some of the brand’s popular shoes that include Air Max 90, Air Presto, Air Flow, Air Current, and the more recent LunarEpic Flyknit. 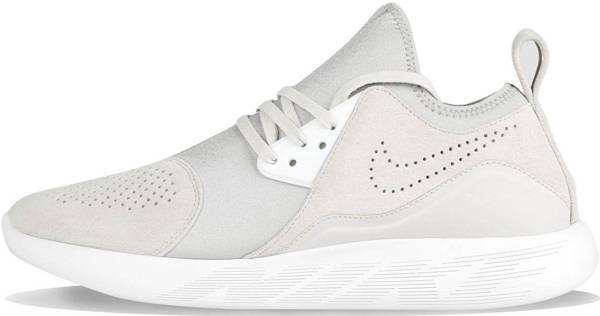 This is also the premium version of the original Nike LunarCharge. Introduced in November 2016, the Nike LunarCharge Premium silhouette drew inspiration from the Nike Air Current which was released way ahead of its time in 1990. To have that sock-like fitting, Nike included a neoprene upper for a more lightweight stride from the Nike Air Flow released in 1988. To better familiarize sneaker fans to their latest design, eye stays from the popular Nike Air Max 90 was included while an internal bootie construction was inspired by the Nike Air Presto released in 1990. But the classic also needs a modern flair and innovation to be relevant. This was fulfilled by the LunarEpic sole which came out also in 2016. The Nike LunarEpic midsole is a product of a new dual-injection technology that uses heat instead of glue to fuse foams into one piece for superior cushioning. With an IU foam carrier and IP core, laser siping on the side of the midsole delivers improved cushioning and targeted flexibility which was also the same technology that the Nike LunarCharge premium uses. Inspired by pressure maps of the foot, the sole of the Nike LunarCharge Premium is a rubber-free outsole with laser-siped pods that move individually for precision compression into a comfortable ride and energy return. A modern city lifestyle sneaker patterned after five classic Nike silhouettes, the Nike LunarCharge Premium is a stylish shoe made of premium materials primarily suede, rubber, and neoprene that gives it a sophisticated look and functional performance for men and women. With suede paneling on the upper, perforations give the most character to the shoes’ aesthetics performing dual functions of brand detailing and ventilation. Inspired by the eyestays of the popular Air Max 90, designers also incorporated the eyestays along with flat lacing. To further expose the Nike branding, the laser-siped lunarlon outsole with NIKE printed on the midsole finishes off the sleek design. The lifestyle sneaker came out originally in Light Bone colorway with other popular colorways also released a few months later. This includes the Black, Medium Olive, Mushroom, and Iced Lilac making it versatile for tastes of men and women. Coming in a versatile design fitted for men and women, the foot is kept snug by a neoprene lining that hugs the feet while a flat lacing system secures the feet into the footwear. The Nike LunarCharge Premium comes in men’s and women’s sizes in medium width D or B. Size ranges from US size 8 to 13 for men and size 5.5 to 12 for women. With innovation coming from five Nike classic silhouettes namely the Air Flow, Air Current, Presto, Air Max 90 and LunarEpic, this lifestyle sneaker has elevated its features to include a lightweight cushioning in the Lunarlon midsole boosting comfort levels all over the footwear. The good mix of neoprene, synthetic rubber and suede paneling also provides great fitting and durability. Lastly, also notable are the laser-siped outsole pods for flexibility and multi-surface traction. Textile lining gives a comfortable in-shoe feel and additional snug fitting. Celebrities spotted wearing the Nike LunarCharge Premium include English rapper Tinie Tempah and pop superstar Justin Bieber.